Elliott Wave Technician Blog: The End of Low Short Term Interest Rates ? The End of Low Short Term Interest Rates ? The western world is indebted beyond their means. The last thing they need is rising interest rates. Let us take a look at the Elliott Wave structure of short term interest rates represented by US 6 months Treasury Yield, and see what we can expect the coming years. 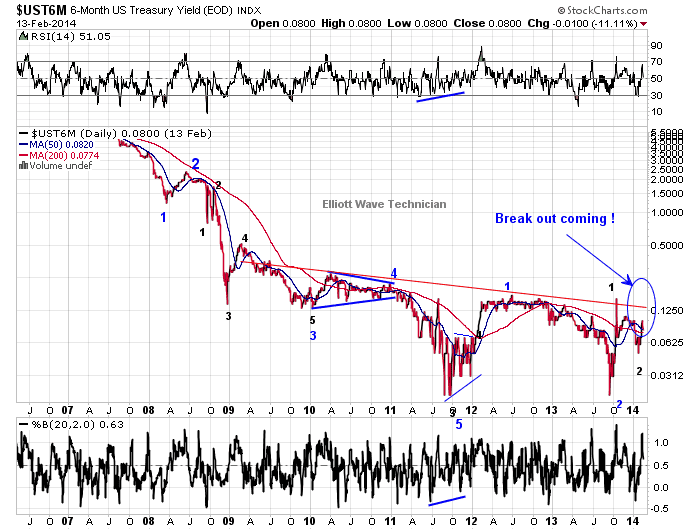 6 months US Treasury Yield is displaying a very bullish structure. A decline in yield lasting more than 30 years was completed in late 2011. Since then a rise and decline in wave 1 and 2 of different degrees of trend have taken place. A rise in wave 3 is coming over the next years and should be quite painful.